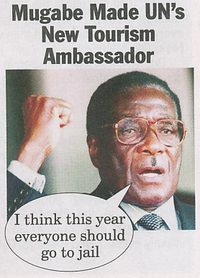 BLOOD DIAMOND DOUBLETHINK & DECEPTION OVER THOSE WORTHLESS LITTLE ROCKS OF DESIRE by Rick Hines & Keith Harmon Snow Zimbabwe is the epitome of diamondthink. From December 2006 to January 2007, Zimbabwe’s police executed Operation Chikorokoza—“end of illegal mining”—against ‘illegal’ gold panners and diamond miners countrywide. Police set up roadblocks and brutalized travelers. They arrested and terrorized at least 24,890 people, and burned down the houses of artisanal miners and others displaced by the international destabilization of Zimbabwe. Meanwhile, police confiscated some 3.5 kilograms of gold worth over $57.3 million; 552,227 kilograms of gold ore; 92 emeralds; and 7,868 diamonds. 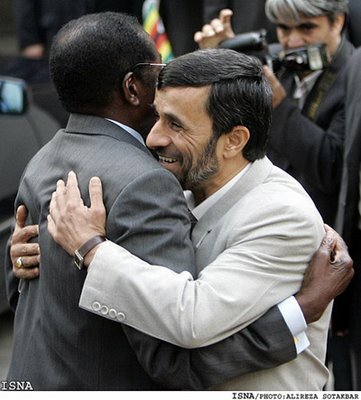 Robert Mugabe’s cronies and their international benefactors have destabilized and depopulated DRC, looting copper, cobalt, timber, uranium and diamonds. Mugabe’s Zanu-PF party in recent years crashed the international media scene for evicting white farmers under ‘land reform’, but untouched are the largest landholders: multinational corporations. Mugabe seized power in 1981 on the empty promise of land reform. In the 1980’s Mugabe and his “liberation” army terrorized the Ndebele people under the Gukurahundi—a bona fide genocide. After arming Mugabe’s gang, the international “community” closed its eyes to the slaughter; attempts to break the story were squashed in Britain and the U.S. 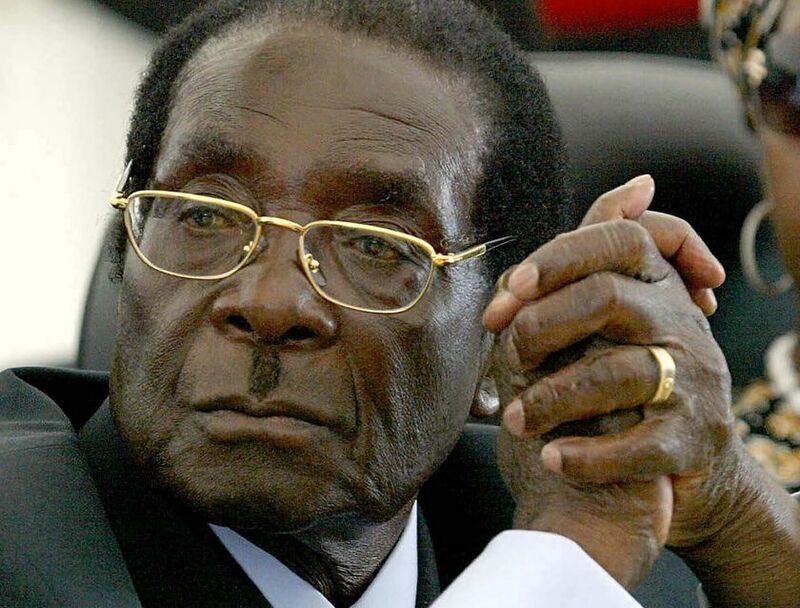 Equally invisible are Mugabe’s ties to international arms dealer John Bredenkamp, one of the 50 richest Britons, worth $1 billion, tied to BAE Systems (British Aerospace) and the U.S. state department, and Billy Rautenbach, another Western mining cartel crony and white patron of Mugabe. 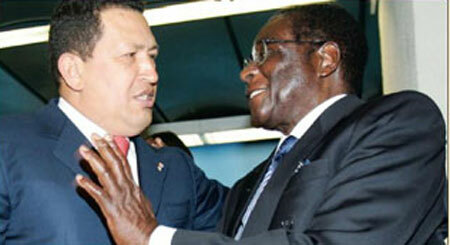 Chavez hugs, cavorts with and embraces bloody Dicator and murderer Mugabe in Rome. 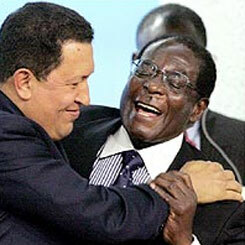 Chávez praised Mugabe’s policies, saying the African leader had been “demonized” and that Venezuela was enacting similar reforms to undo “the unfair structures of colonialism.”. This picture and Chavez words are extremely offensive to me and represent the opposite of everything I believe in.. I guess it takes one to know one. Very obscene. Caracas, Venezuela - Venezuelan President Hugo Chavez praised Zimbabwe's embattled President Robert Mugabe as a "freedom fighter," bestowing the visiting African leader with a replica of South American independence hero Simon Bolivar's sword. "I give you a replica of liberator Simon Bolivar's sword," Chavez said Thursday after the two leaders signed an energy co-operation agreement. "For you, who like Bolivar, took up arms to liberate your people. 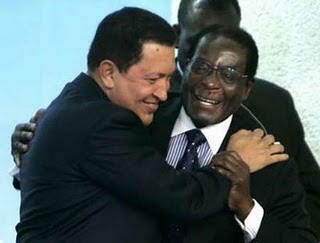 For you, who like Bolivar, are and will always be a true freedom fighter," Chavez said. "He continues, alongside his people, to confront the pretensions of new imperialists." Mugabe, who was in Venezuela for the February 27-28 summit of the G-15 group of developing nations, grinned as he unsheathed the sword and swung it about. 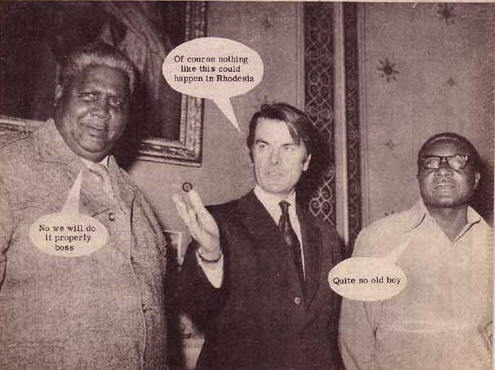 Mugabe came to power in 1980 after a seven-year bush war for black rule forced a peace conference and British-supervised elections in Zimbabwe, then known as Rhodesia. Earlier, Mugabe thanked his "brother President Chavez" for inviting him to Venezuela and stressed the importance of poor countries co-operating to build "integrated, strong" economies "able to resist the dominance of the North". Mugabe, 80, faces mounting international pressure to step down after more than two decades in power. 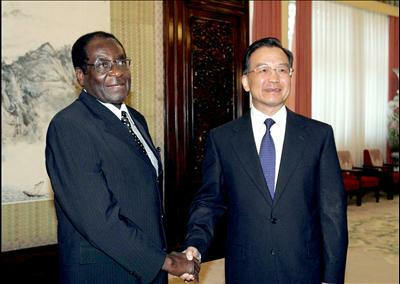 Zimbabwe is mired in its worst political and economic crisis since independence, with acute shortages of food and fuel. 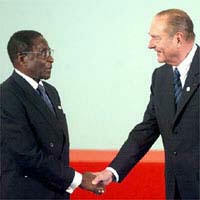 Opponents say the 2002 elections that re-elected Mugabe were marred by intimidation and vote rigging. Chavez said he identified with Mugabe's struggles because he himself was fending alleged US-backed attempts to overthrow his government. The leftist Chavez accuses the United States of being behind a failed 2002 coup and of funding groups now seeking a recall referendum on his rule. Washington denies the charges. "We are confronting conspiracies and coups supported by Washington, whose government is once again charging with the fiercest flags of imperialism," Chavez said. Relations between Venezuela and the United States are tense over Chavez's friendship with Cuba's Fidel Castro and his opposition to US-led negotiations for a hemisphere-wide free trade zone. Washington was slow to condemn the 2002 coup attempt, initially blaming Chavez for his own downfall.